The press conference took place a day before the scheduled Feb. 18, 2017, launch of the Commercial Resupply Services (CRS) 10 mission with topics covering everything from launch pads to SpaceX’s plans for Mars. Shotwell started by setting expectations for the attendees. She said that the CRS-10 mission should lift off on time at 10:01 a.m. EST (15:01 GMT); however, if the company needs more time because LC-39A is a new pad for SpaceX, it has backup opportunities for launch on following days. 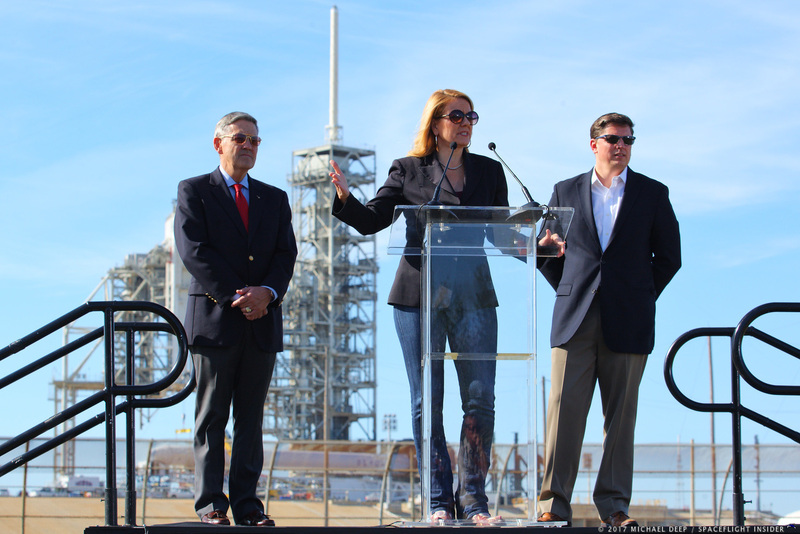 Shotwell also said the company is in the process of building a number of Crew Dragon spacecraft, and it is hoping to launch the first uncrewed demonstration flight late in 2017, also from LC-39A. “There’s some work to do on the pad […]. We have the crew arm to put in and we’ve got some other upgrades as well,” Shotwell said. While SpaceX’s current manifest does not require adding to LC-39A’s Fixed Service Structure, Shotwell said that the company would need to add some height to the 305-foot (93-meter) structure if it wants to add vertical integration capabilities for national security payloads. “We’re good where we are with crew [launches],” Shotwell said, referring to the current structure. She said SpaceX plans to add a crew access arm for Crew Dragon before the end of the year. SpaceX is also working to make all its launch pads operational. Space Launch Complex 40 is expected to be back online this summer while the company’s work on its new spaceport in Brownsville, Texas, is doing “dirt work”. 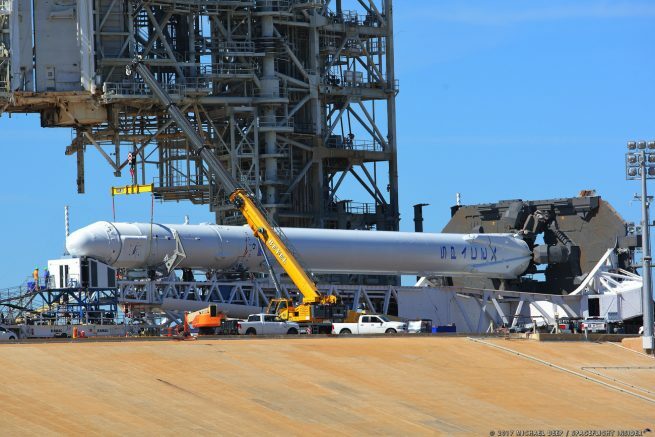 Earlier in the day, SpaceX CEO Elon Musk tweeted that a small leak on the Falcon 9’s upper stage had cropped up. Shotwell clarified the issue more. The plan right now is to continue with the countdown. Musk later tweeted that the company added an abort trigger at T-minus 60 seconds to verify the spin system is working properly. Asked about the first launch of Falcon Heavy, Shotwell said the plan was to launch it this summer as soon as repairs to SLC-40, just south of LC-39A, are finished. Shotwell confirmed that SpaceX has all but given up on launching a Dragon capsule toward Mars in 2018 as part of the company’s Red Dragon program. “We were focused on 2018, but we felt like we needed to put more resources and focus more heavily on our crew program and our Falcon Heavy programs,” Shotwell said. The goal of Red Dragon is to take an unpiloted Crew Dragon spacecraft that was previously flown and put it on a Falcon Heavy to send it to the Red Planet. Launch windows to send spacecraft to Mars open every 26 months. 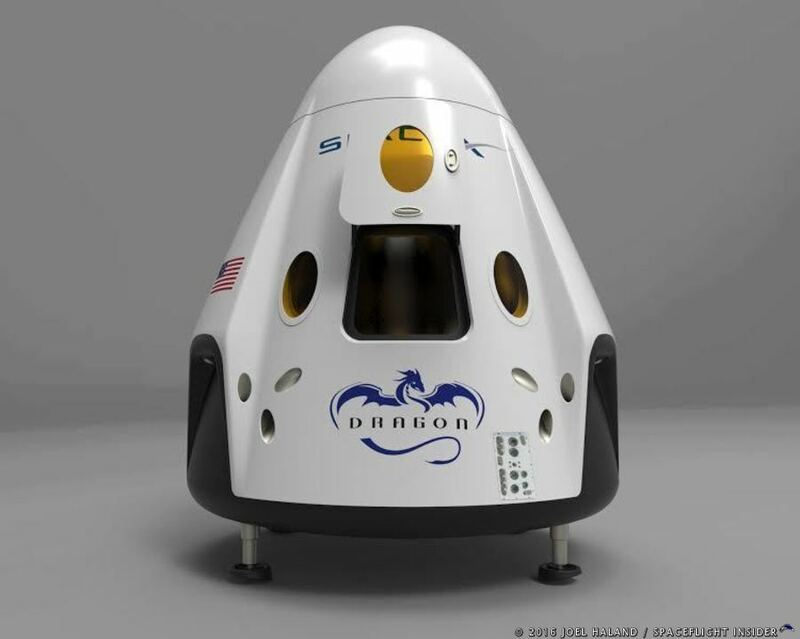 As such, the next opportunity for the company to send a Dragon to the planet would be 2020. The added time also means there is more time for payloads to be developed for the spacecraft. “We can fly more in 2020 because people are more ready than they are in 2018,” Shotwell said, adding even an empty Dragon would be the largest payload ever landed on the red planet. After launching toward space, the first stage of the Falcon 9 carrying CRS-10 will be returning back to Landing Zone 1 (LZ-1), formerly Space Launch Complex 13, for a ground landing. Shotwell, however, said she gets more nervous for launches than landings. SpaceX’s booster landing at LZ-1 will be the third attempt to return the booster to land, the second for a NASA flight. In response to the Government Accountability Office (GAO) stating that the Merlin engine’s turbopump blades would need to be redesigned, Shotwell said that the story was “not news”. She also said that she was confident SpaceX will fly crew in 2018. Though confirming that the Falcon upper stage would not be reused, Shotwell was optimistic about a redesign for reuse of the payload fairing. The design for the autonomous flight safety systems on board CRS-10 has been in use for a while. Shotwell said, however, that the company has flown with the autonomous system on previous flights in “shadow mode”. CRS-10 will be the first time it is used as the primary system. “We were told to fly this,” Shotwell said but added that Falcon 9 would have done so regardless, as it makes SpaceX’s operations more streamlined. SpaceX said it hopes to begin launching every two or three weeks after the flight of CRS-10. However, Shotwell stressed that the most important thing was to just “get flying”. One thing that had kept them waiting was a Federal Aviation Administration license to launch.